Daenerys Targaryen, eat your heart out! Look, we love the Mother of Dragons as much as the rest of you. So much so, that we’re as nervous as we are excited that Game of Thrones is back (they’d better not hurt Drogon—that’s all we’re saying). 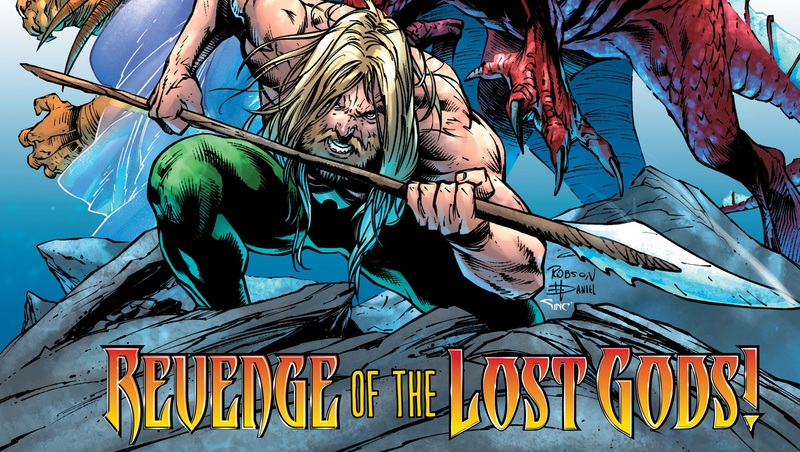 But this week’s Aquaman #47 is almost enough to put last night’s season premiere out of our mind. Almost. Aquaman watched in horror last issue as Earth’s mother, Namma, who is burning with rage because her children slaughtered her husband (gods, they’re always so much drama! ), transformed into a massive, spiked dragon who’s determined to salt and destroy the Earth. Vowing to stop her, Arthur leapt atop Namma…but what is his plan exactly? He’s unarmed, mortal and to make matters even worse, still doesn’t remember who he is. He thinks he’s just an unremarkable drifter named Andy. Arthur may have the best intentions, but things aren’t looking great for him. Aquaman #47 by Kelly Sue DeConnick, Robson Rocha, Daniel Henriques and Sunny Gho is in stores Wednesday.